This innovative Hero bamboo/hemp cloth diaper insert is designed to give you a customizable option when fitting your child's wetness capacity with absorbency. This is a two-piece set, consisting of a three-layer pocketed insert, and a two-layer microfiber Step-Up Insert pre-stuffed inside. It is the ultimate in overnight protection and offers you the best of all fibers. The fibers of the Bamboo/Hemp offer you a long lasting tight hold to the wetness, while the microfiber gives you the fastest absorbency of any cloth insert on the market. Together, this insert combination gives you the best of the qualities that modern day absorbency fibers can offer, but you will have to wash the bamboo insert 6-10 times for it to shrink down, fit in your undies, and be optimally absorbent. If your child still wets through this insert, use additional absorbency to match their output capacity. The size and shape of this diaper insert is perfectly matched to the Nighttime Underwear Hero, offering full coverage from the top of the front of the undies to the top of the back of the undies. The flared-out contoured shape gives even more soaking power to the insert and helps it lock in place. Separate included two-layer microfiber Step-up Insert. 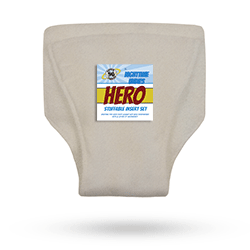 The Hero Undies, a base price of $ 24.95 is a shell and does not come with an insert. Some stores may offer inserts as an add-on, while some places may list inserts separately. We display them like this to give people the option of using inserts they already have at home (and many people have invested a lot of money into expensive inserts already) and to give people the option to choose the fiber they think will work best for them. Why does the big insert have a number for the size and the small insert have a letter? What if this diaper insert does not absorb all my child can pee out in one night? The magic formula for making any cloth overnight product work is to match or beat your child's output capacity with absorbency. Most parents will find the insert that comes with the product is adequate absorbency for what they need, but some will have to seek additional absorbent options. For this reason, you can always get an additional Step-up Insert and add it behind the Hero Insert Set, or even a cotton washcloth! The cost of using disposables every night for years will seem like a weight off your shoulders if you just find that magic output/absorbency ratio for your undies.